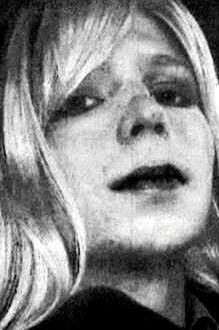 WASHINGTON: Pentagon Approves Gender Transition For Chelsea Manning - Joe.My.God. In an unprecedented move, the Pentagon is trying to transfer convicted national security leaker Pvt. Chelsea Manning to a civilian prison so she can get treatment for her gender disorder, defense officials said. Manning, formerly named Bradley, was convicted of sending classified documents to anti-secrecy website WikiLeaks. The soldier has asked for hormone therapy and to be able to live as a woman. The request was the first ever made by a transgender military inmate and set up a dilemma for the Defense Department: How to treat a soldier for a diagnosed disorder without violating long-standing military policy. Transgenders are not allowed to serve in the U.S. military and the Defense Department does not provide such treatment, but Manning can’t be discharged from the service while serving his 35-year prison sentence. Some officials have said privately that keeping the soldier in a military prison and unable to have treatment could amount to cruel and unusual punishment. RELATED: Secretary of Defense Chuck Hagel said on Sunday that the ban on transgender service members “should be reviewed.” Ten nations currently permit transgender military service: Australia, Belgium, Canada, the Czech Republic, Israel, the Netherlands, Spain, Sweden, Thailand, and the United Kingdom.